Net Profit or Net Income (the two terms will be used interchangeably) is the final figure or bottom line on an Income Statement. It is, perhaps, the accounting figure to which the most attention is paid, since it not only represents the amount by which shareholders’ or owners’ equity will increase but acts as an indicator of operational performance. It has wider implications too. For example, a fundamental principle of accounting is the assumption that an enterprise is a going concern. Business operations threaten that concept if they consistently fail to turn a profit. A look at the Income Statement of the hypothetical General Manufacturing Company will show how Net Income is derived. Net Income or Net Profit is indeed the bottom line. It is the residual amount left after a variety of expenses and charges are deducted from revenues. First, Gross Profit of $2,500,000 is derived by deducting Cost of Revenues $7,500,000 from Revenues of $10,000,000. 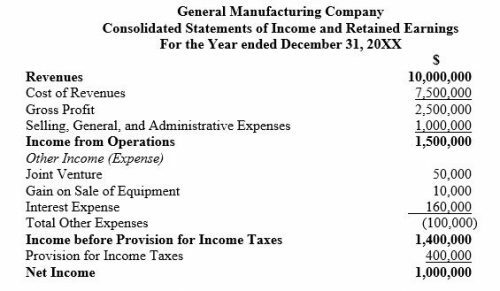 Second, Selling, General, and Administrative Expenses of $1,000,000 are deducted from Gross Profit, leaving Income from Operations of $1,500,000. Non-operational income ($60,000) and non-operational expenses ($160,000) net to $100,000, leading to Income before Provision for Income Taxes of $1,400,000. Finally, after a Provision for Income Taxes of $400,000, Net Income of $1,000,000 remains. Superficially, the measurement of net income appears straightforward. However, at least three issues – accounting period, continuity, and matching – may give rise to difficulty. First, it is not always easy to assign either revenues or expenses to short accounting periods, such as a month. Purchases of certain fixed assets, such as buildings or machinery, have effects that extend many months or even years. Consequently, some artificial methods are employed to arrive at monthly costs for such assets. For example, in the case of machinery and equipment, estimates are made of the useful life. As will be obvious, such estimates are prone to errors. In any event, since no one has knowledge of the future, these estimates provide the optimal assessment of future costs. The example below will show how these estimates are applied. The depreciation charge serves two related but distinct functions. First, since long lasting assets have, by definition, a life that spans many accounting periods, it provides a way to spread the cost of the asset over the time it will be contributing to the enterprise. Second, depreciation provides a way of recording the reduction in the value of an asset over time. A machine that costs $100,000 today is unlikely to be worth the same in 10 years’ time. It may still have some value, not because of its original functions but due to, perhaps, to its metal content. By applying a regular depreciation charge to the asset, its value can be determined at any point in time. By writing down the cost of the machine over its useful life, the accounts provide a more realistic picture of business operations. The machine’s gradual reduction in value also accords with common sense. The machine’s loss in value is likely to occur in a measured way. Indeed, depreciation usually takes the form of this straight-line method. Mention has been made of the issue of continuity. A fundamental tenet in the accounting framework is the going concern principle. There is, for example, no point in spreading the cost of a machine over 10 years, when the business will not survive for more than two. About 20 percent of new businesses fail in the first year. Less than half survive for 5 years. Nevertheless, the financial statements are prepared on the assumption that the enterprise is destined for a long life, that it is a going concern. Whether an enterprise is a going concern or not affects the value of its assets. For example, specialized machinery has value because of its application in a particular line of business. It may have little use in other processes, which means its value is less in those alternative uses. Consequently, if the machinery is disposed of, its value will be less than that recorded in the accounts of a going concern. Third, accounting makes use of the matching principle, under which expenses are recognized in the same accounting period, which records any revenues they were instrumental in earning. An obvious example are sales commissions, which should appear as an expense in the same month or year as the sales they relate to. The principle of matching is also linked to the further concept of separating cash transactions from transactions of economic value. The concept seems clearer when applied to economic benefits received, which can take the form of assets or services. GMC, for example, may buy raw material on credit. It will recognize the inventory as an asset on the balance sheet and it must also recognize that it now has a liability: the amount owing to the supplier of the raw material. The following T-accounts show the position after GMC takes delivery of $60,000 of raw materials on credit and pays cash for $40,000 more. Where a tangible asset such as inventory is involved, it may be obvious that the business must take note of it. However, the same rule applies to intangibles. For example, if GMC were to contract with an advertising agency to promote its products, and the agency commenced work on a campaign, as a result, GMC would incur costs as that work proceeds. Typically, every month, an estimate of the work done by the agency would be made and the charge recorded. An estimate of work done amounting to $5,000 would produce the following entries. Many businesses enterprises may not accrue expenses in this way, particularly since accounts for the business are not produced in a timely fashion. Usually, by the time the financial statements are prepared, the enterprise has already received an invoice for the work done from the advertising agency, and can use that invoice as the source document for the accounting entries. First, the following entries are made: Dr Advertising Expense; Cr Ad Agency for $5,000, using the invoice as the source document. Second, when the ad agency is paid, the following entries are made: Dr Ad Agency; Cr Bank for $5,000. Failure to make adjusting entries to records accruals is not good practice. By doing so, the accounts are affected in three ways: (i) expenses will be understated, since a business expense was not recorded; (ii) liabilities will be understated, since an amount owing to a third party has not been recorded; and (iii) net profit (net income) will be overstated in the Income Statement (Profit & Loss Account). 1. Consider the following monthly data (in dollars) for General Sales Company for January through June and calculate the profit (or loss) for the half year. 2. Given the following monthly data (in dollars) for Acme Manufacturing Company for July through December, calculate the net income (or loss) for the calendar year 4th quarter. 3. Given the following monthly data (in dollars) for Juniper Jumpsuit Company for January through June, calculate the net income (or loss) for the first two quarters. 4. Consider the following monthly data (in dollars) for Juniper Jumpsuit Company for January through June and calculate the net income (or loss) for the first quarter.